This summer I reported a few items based on claims made to me by actor David Hasselhoff. According to newly-available documents, it looks like The Hoff lied to me. And he's not responding to my follow-ups. 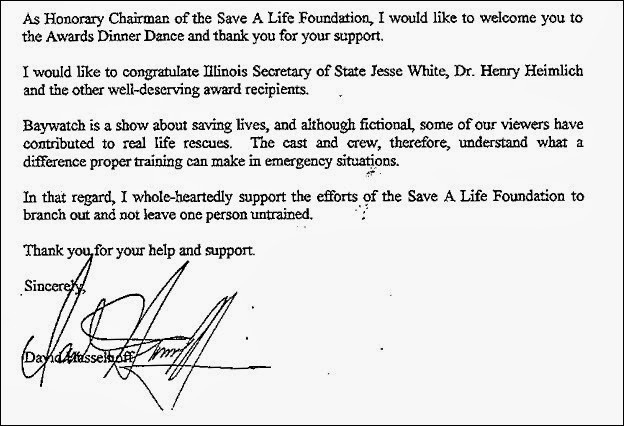 (The Save a Life Foundation) received nearly $9 million in state and federal funding for a program whose services, it appears, were never rendered. Since its establishment in 1993, (SALF) pledged to teach school children first aid and emergency response practices...(However), very few records of students being taught have been found. From 1993 to at least 2000, in grant applications, fundraising materials, and media reports, SALF claimed that Hasselhoff was the group's "Honorary Chairman of the Board" and actively supported the group's mission. As reported by ABC7 Chicago and other media outlets, SALF used a variety of bogus claims to gin up millions in public and private dollars, so I wanted to find out if they also lied about the Baywatch star's affiliation. I sent his press agent these and other documents that originated from SALF, along with news articles in which Hasselhoff is identified as SALF's "Honorary Chairman" and was an enthusiastic booster of the organization. I was able to reach Mr. Hasselhoff over the weekend. He's currently out of the country working in UK on his way to Austria but I had told him of your pending deadline today. He was never SALF's Honorary Chairman. He never had any financial relationship with SALF. He never had any personal contact with SALF. 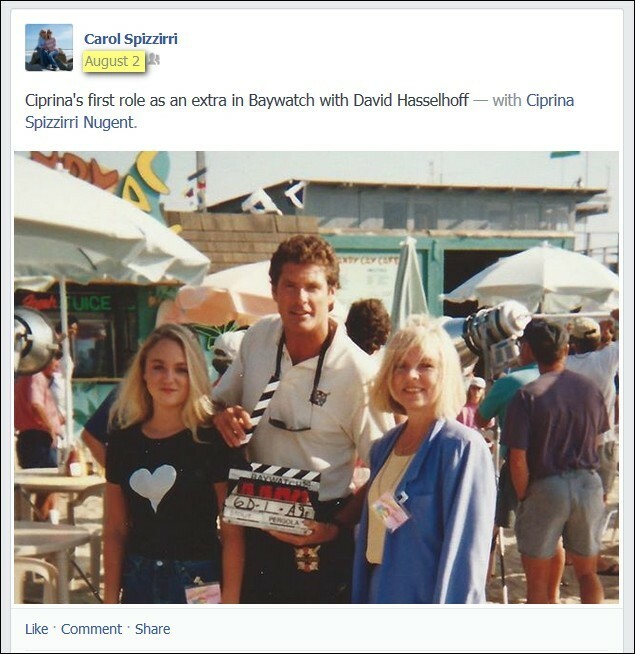 They had requested, through the production office at Baywatch, for David to do a psa about saving lives back in the 1990's while he was starring on Baywatch. The letter you sent me was prepared and written by someone in the Baywatch production office around the same time. Who knew that Spizzirri -- who now lives in a mobile home park in San Marcos, CA, according to the jaw-dropping article Where Did the Save-A-Life Money Go? -- reads my blog? In any event, I appreciated her uploading the photo. But rubbing elbows with Hasselhoff on the Baywatch set doesn't amount to much and in a follow-up, I gave him the benefit of the doubt. Based on his word, I even tried (unsuccessfully) to obtain a published correction from the Chicago Tribune, which over the years had run three articles that reported the SALF/Hoff relationship. But a couple of documents I've since obtained via a FOIA request suggest his word ain't worth much. I shared the new information with his press agent and asked for a response. David is currently in Abi [sic] Dhabi but should be back in the states by the weekend. I am not able to reach him until then...probably Monday. I can discuss it with him then. I've sent several follow-ups, but no further replies. If I ever get one, I'll publish it. Finally, a couple of personal notes. To David Hasselhoff: I don't like my blog being used to circulate lies. To Carol Spizzirri: If you have any more documents or photos re: The Hoff, Jesse White, Paul Vallas, or other VIPs who were involved with SALF, would you please post them or e-mail them to me?